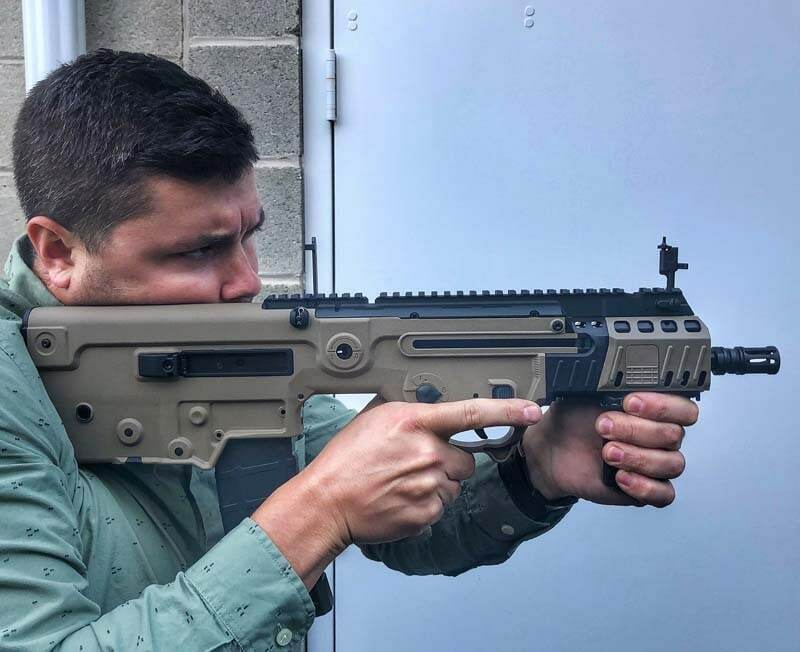 For shooters bored with AR carbines, the IWI Tavor X95 is an exciting new endeavor. The Israeli-designed and Pennsylvania-made short barreled rifle makes best use of the bullpup design. The space saving rear action keeps the gun short but without sacrificing in other areas. The result is an efficient compact package. The Tavor X95 evolved from Israeli Weapons Industries’ Tavor rifle family, which all incorporate the bullpup operation. Although the design has been around since the early 2000s, it became standard issue in the Israeli military in 2009. Since then, a long list of other countries started equipping their troops with the gun as well. The re-design offers more intuitive and adaptable controls than the original. The X95 functions using a long-stroke gas-piston bullpup operating system. However, Israeli Weapons Industries offers the X95 in multiple configurations for the U.S. civilian markets. Options include 13-, 16.5 and 18.5-inch barrel lengths; and right- and left-handed controls. While 5.56mm is standard, 9mm and .300 BLK chamberings are also available. Wanting the full compact experience, I opted for the 13-inch model. The bullpup really gives the X95 the edge length-wise. Even with the longer barrel – than say a 10.3-inch on an AR – the X95 still comes in significantly shorter. Although the X95 had a very short profile, that didn’t mean less weight. Unloaded, it weighs 7.5 pounds, about 2 pounds heavier than some AR15 SBRs. Yet, most of the weight fell to the rear of the gun, which made sustaining a firing or low ready position easier for a longer period of time. If the gun had a cockpit, I was sitting in it. The gun’s short profile and weight distribution made quick target transitioning even easier since the front of the gun was so light. Still, I added a vertical grip to the Picatinny rail, which allowed me to keep the gun tighter into my shoulder. For shooters accustomed to operating an AR learning to reload an X95 will take some time. While the X95 mag release is in a somewhat familiar spot, it gets a little weird after that because the magazine feeds behind the trigger. 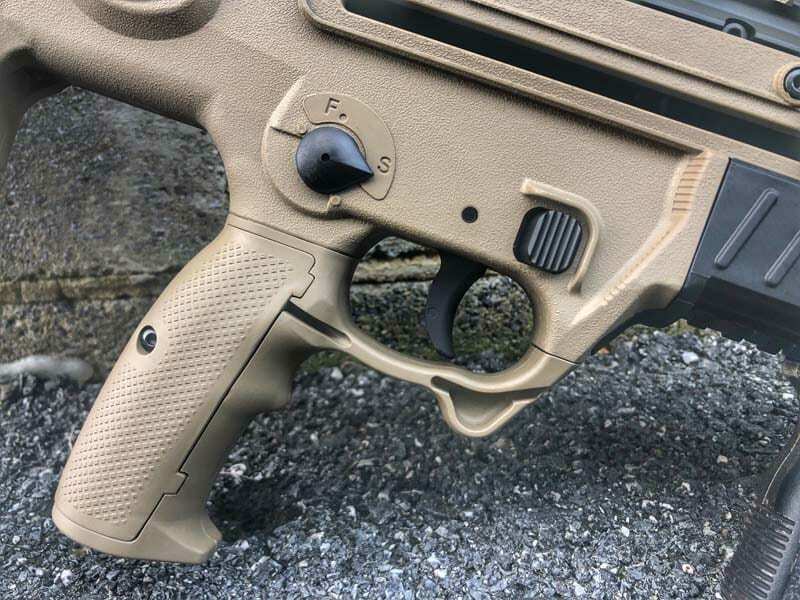 Then, the bolt catch sits directly behind the magwell. Like other bullpups, the X95 trigger was a bit sub-par. The 6-pound pull had a relatively long take up and felt pretty mushy. On the reset, there’s a pronounced “thud” that signals the gun is ready to fire again. Aftermarket triggers are available, but only for those ready to shell out some serious coin. The Tavor X95 controls can be adjusted to accommodate left-handed shooters. Although standard configuration is for righties, both the charging handle and ejection port can be moved. Also, the mag release and bolt catch are ambi-ready. Although I haven’t always been a fan of bullpups, I could see myself using the IWI Tavor X95 on a regular basis. It’s comfortable, reliable and the recoil impulse is predictable. For me, the biggest hurdle was learning the manual of arms. But that just meant more time on the range. However, if anyone thinks the adjustment might be too great, just know that more training courses dedicated to the design along with more and more aftermarket support are popping up. To those dissatisfied with the status quo of the AR15 – left-handed shooters in particular – the X95 might provide some solutions. MSRP is listed as $1,999.